New York nightclub singer Eleanor Spencer is the only witness to a murder committed by her boss, gangster Mike Scarlotti. She flees, but on her way to Los Angeles, she is recognized by Martin Simms, the racketeering owner of the Blue Moon nightclub in Turquoise City. Though she first refuses, he convinces Eleanor to sing at his club by working on her fear of Scarlotti. 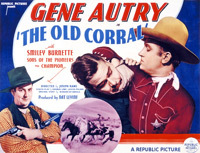 Sheriff Gene Autry helps Eleanor with her debut by advising her to change her program of torch songs to a repertoire of western favorites. Simms, expecting a reward from Scarlotti, wires him of Eleanor's whereabouts. When Scarlotti and his gang arrive, Deputy Frog Millhouse recognizes them and warns Gene, who orders Frog and Eleanor to hide. But Scarlotti sees them leave and sets out in pursuit. Gene and the singing O'Keefe brothers, who had earlier been arrested, follow and stampede a herd of steers directly at the gangsters, who were preparing to explode the shack where Frog and Eleanor had taken refuge. The gangsters flee, and all are captured. Gene promises to stay by Eleanor's side forever.